Q: The Japanese government announced today that "Reiwa" will be the new era name. Does the Chinese government have any comment? A: What you said is Japan's internal affairs. We are not going to comment on that. Q: According to reports, the previous era names all drew from ancient Chinese classics, and this is the first time that an imperial era name is selected from a Japanese classic. How does the Chinese government look at this change? A: Like I just said, this is Japan's internal affairs and we are not going to comment on that. Now that you asked again, I would like to elaborate a little more on the China-Japan relations. Our bilateral relationship is showing positive momentum toward improved and stronger ties. Following the principles written in the four China-Japan political documents, we stand ready to work with Japan to keep up with the trend of the times, continue to foster sound and steady growth of our bilateral ties, and contribute to the welfare of the two peoples and the peace, stability and development of this region and beyond. Q: Last weekend, Prime Minister Imran Khan of Pakistan attended the ground breaking ceremony of a new international airport at Gwadar. This airport will be constructed by a Chinese company, and it is believed that this project will be very important for regional connectivity and shared prosperity. What is your response? A: China and Pakistan have carried out a series of practical cooperation projects under the Belt and Road Initiative, and the airport at Gwadar you mentioned is one of them. We applaud Prime Minister Imran Khan for attending the ceremony. We are confident of the prospects of the China-Pakistan Economic Corridor which, we believe, will bring tangible benefits to our two countries and peoples and contribute to regional connectivity and growth. Q: I'd like to ask about President of Panama Juan Carlos Varela's visit to China and his attendance at the upcoming second Belt and Road Forum for International Cooperation. Can you elaborate on it? A: As I said last week, the second Belt and Road Forum for International Cooperation (BRF) will be held in late April in Beijing. As an important international gathering after the first BRF, we believe it will be another milestone of the Belt and Road cooperation. As for which foreign leaders will attend the BRF, China will release the information at an appropriate time. 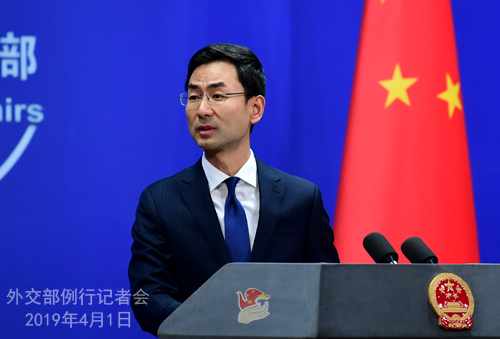 Q: Can you give us some information on the itinerary and agenda items of the ninth round of China-US high-level economic and trade consultations to be held this week? And what are China's expectations? 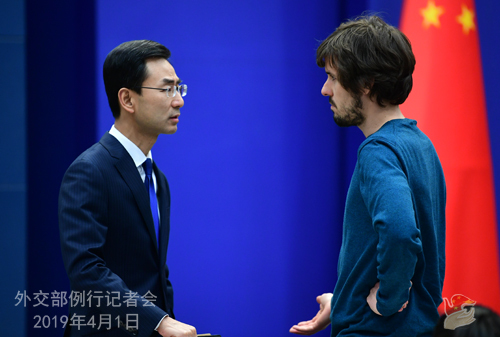 A: Last week the spokesperson of China's Ministry of Commerce answered questions on the ninth round of China-US high-level economic and trade consultations. Vice Premier Liu He and his team started their trip to the US for the consultations earlier today. 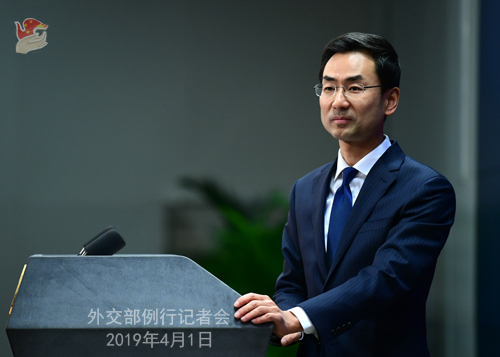 Building on the substantive progress achieved, we hope the Chinese and US teams can continue to work with concerted efforts, meet each other halfway, implement the important consensus reached by the two Presidents, and work towards a mutually beneficial agreement. Q: Last Friday, the US prompted members of the UN Security Council to have consultations on the draft resolution on the listing of Masood and it may push the Security Council to take actions in the coming days. If the US pushes for a vote on the draft resolution at the Security Council, what will be China's position? A: We have repeatedly stated our position, which is clear and consistent, on the listing of Masood. We hope all parties can meet each other halfway and continue to deal with the issue under the 1267 Committee for a proper solution. Last Friday, members of the Security Council exchanged views on the draft resolution circulated by the US. The majority of them agreed that the listing issue should be resolved through dialogue and consultation under the 1267 Committee instead of by pushing for a vote on the draft resolution. Recently China has been working on all parties and achieved positive results. The US is aware of that. However, it still prompted the draft resolution to be adopted at the Security Council, which makes no sense at all. What the US did has set a bad precedent as it is not in line with the Security Council rules and customary practices. It will only complicate matters and will do no good to peace and stability in South Asia. That's why China must oppose it. Q: The Chinese and New Zealand leaders are having talks today. A certain New Zealand agency previously claimed that there are problems with Huawei. Regarding this topic, what will the two sides talk about? Well, I can brief you on it. During the talks, Premier Li noted that China and New Zealand need to advance bilateral economic and trade cooperation and make the pie bigger. The two sides need to foster a business environment that is fair, just, transparent, convenient and non-discriminatory for bilateral investment, and speed up negotiations on an upgraded FTA for better growth of our economic and trade ties. Prime Minister Ardern said that New Zealand welcomes Chinese investment, and will offer a sound business environment for companies of all countries with no discrimination. As New Zealand has a tradition of making independent foreign policies, its decisions on important issues will also be independently made in line with its national interests. President Xi Jinping will also be meeting with Prime Minister Ardern this afternoon. We will release relevant information in a timely manner. You may follow up on that. Q: According to Reuters, on Sunday Taiwan scrambled aircraft to "drive away" two Chinese fighter jets that flew past the "middle line" in the Taiwan Strait. Can you confirm this information? A: I'm not aware of what you mentioned. I would like to refer you to the relevant authority. Q: In your answer to the 1267 Committee question, you spoke of positive results China achieved on the issue and that the US is aware of it. Are you talking about the positive results to list Masood Azhar in the 1267 Committee? 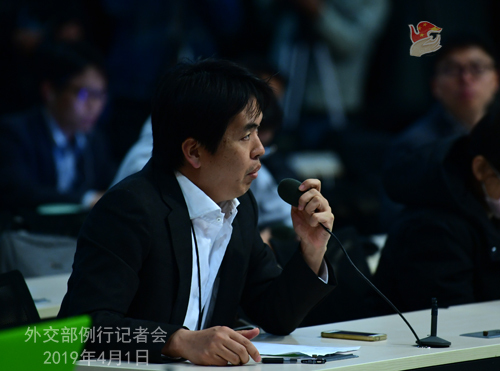 A: After the relevant members put forward the listing request at the 1267 Committee, the Chinese side has all along stayed in close communication and coordination with all relevant parties on the issue. Like I said earlier, we have been working on all parties and achieved positive results. The US knows it. We believe that under the current circumstances, it makes no sense to push for the draft resolution at the Security Council. Such attempt is not at all constructive and has set a bad precedent. Follow-up: Just to put it differently, can we say "achieved positive results to resolve the issue"? A: Yes, the US is aware of it. Q: Some diplomats in Washington believe that the US is showing haste in this listing issue by passing the procedure just to give benefit to the ruling party in India because they will be going for election this month. What's your comment? A: Like I said earlier, what the US did has set a bad precedent as it is not in line with the Security Council rules and customary practices. It will only complicate matters and will do no good to peace and stability in South Asia. As for the general election in India you talked about, it is India's internal affairs and I am not going to comment on that.